The Notice of Workers' Compensation Reinstatement Rights is a general labor law poster poster by the Vermont Department Of Labor. This poster is mandatory for some employers, including employers who employ 10 or more people. This poster must be posted in a conspicuous place by all employers who regularly employ ten or more people so that all employees can see it. This poster describes when employers have obligations to rehire workers who have been previously injured working for them including what benefits must be reinstated should they return. It appears you don't have a PDF plugin for this browser. 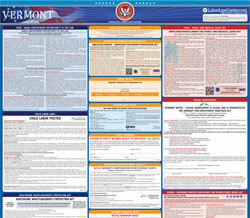 Please see the link below to download vermont-wc-9-employers-reinstatement-poster.pdf. or an alternative suitable position. off a current employee in order to comply with this law.